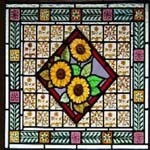 Historically,antique window design for early stained glass windows, was drawn out on a whitened table top. The design artist would map the outlines of his drawing, the shape and color of the individual pieces of glass to be used, and the position of lead strips (calmes) that would eventually hold all the pieces of glass together. From the early fourteenth century a range of colors varying from a pale lemon to a deep orange could be achieved on one piece of glass through the discovery of 'silver stain', a silver compound painted on the back of the glass and then fired in a kiln. By the mid sixteenth century many different colored enamels were being used. As a result, windows began to be painted like easel pictures on clear glass of regular rectangular shape, with lead calmes no longer an integral part of the design. These methods prevailed from the seventeenth to early nineteenth centuries. In Victorian times the earlier methods were revived. 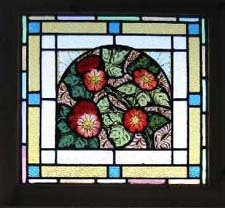 These methods were used for many of the antique windows on this site..
For more information on antique window manufacture and design.click here. Easyboo.com is a frequent antique window seller on Ebay.com and welcomes you to check out the comments of previous purchasers.